Delicate pink hues and pearlized paint details enhance these exceptional baptism gifts from Avalon Gallery's Baptized in Christ Collection. This elegant, adorable and very cheerful collection is gift boxed for gifting on the infants special day. 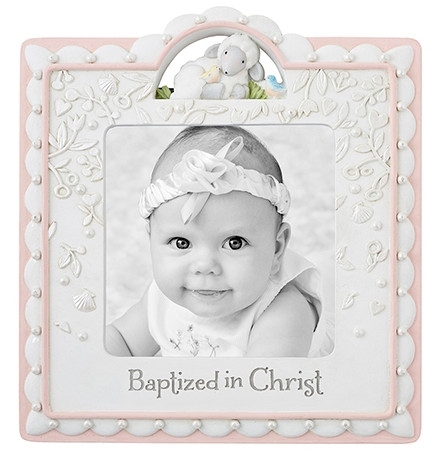 This pink photo frame will forever capture the excitement and wonder of the special day. Beautifully sculpted with the image of a sheep and inscribed with the words - Baptized in Christ. Holds 4" x 4" photo.